First of all, we would like to express our warm appreciation for the efforts of everybody toward the development of Karatedo. We are very happy to announce that it has been decided that The Emperor’s Cup and The Empress’s Cup will be given to the champions of Japan Cup Karatedo, fulfilling the earnest desire of everybody concerned in Karatedo. The ceremony of notification was held at 10:00 on Tuesday the 17th of May, 2016 at the Imperial Household Agency. 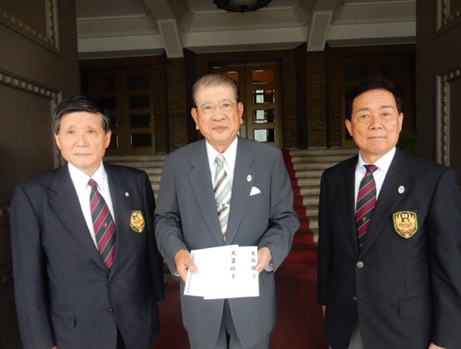 President Takashi Sasagawa, Vice President Shigeo Kurihara and Secretary General Shuji Kusaka attended the ceremony and The Emperor’s Cup and The Empress’s Cup were commissioned in the presence of Mr. Michiyasu Takahashi, Deputy Commissioner of the Japan Sports Agency. 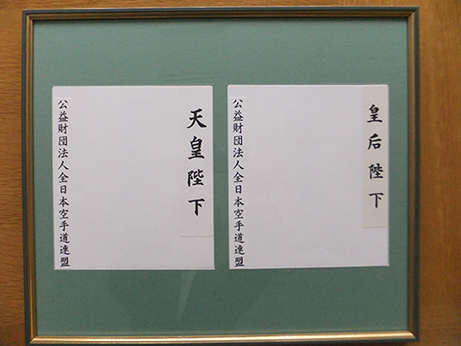 All entered their names in the list of visitors to the Emperor and Empress, and thus the ceremony was completed. The Emperor’s Cup will be given to the male individual kumite champion, and the Empress’s Cup will be given to the female individual kumite champion of the Japan Cup Karatedo, next at the Nippon Budokan on December 11, 2016. “KARATE” Tokyo 2020 Olympic Games Press Conference Held in Reaction to Addition to Games!